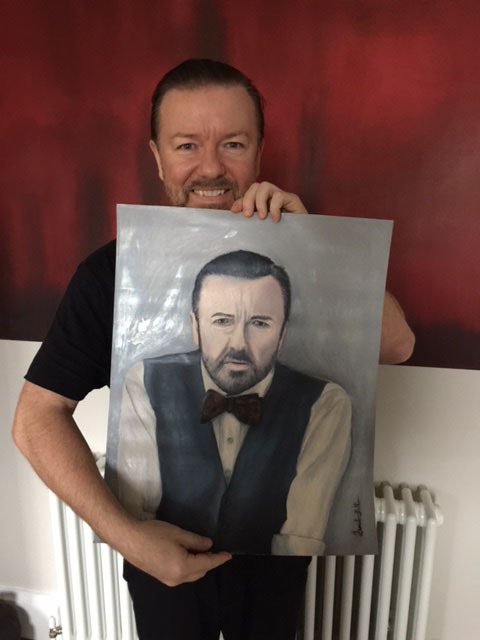 Straight from the United Kingdom, the king of comedy Mr. Ricky Gervais receiving his oil painting! The oil artist Fernando Bello will paint (by hand, with professional oil brushes) an oil painting using your photo as a reference. You don’t have to buy the final product if you don’t like it! We will refund your order once the painting is returned. "I start by first priming the blank canvas with gesso, as it dries, using a pencil, I sketch the main subject using your photo as a reference (no tracing); once I have a good composition, the painting process begins, using artist grade oil paints and mediums." The artist – Fernando Bello – has been painting for many years, his style varies depending on commissions; He will work with portraits, pets, loved ones, dragons, fantasy, anything! “Happy are the painters for they shall not be lonely. Light and color, peace and hope, will keep them company to the end, or almost to the end, of the day.” Winston Churchill. All paintings will receive a few blows of cigar smoke, a unique and special signature trait only found on this artist paintings! "Coming together is a beginning, staying together is progress, and working together is success." Henry Ford. Send a request for a quote on your very own framed portrait that will last through the ages. Hand painted just like it was by the old masters!